Happy Christmas Eve fellow food lovers! ‘Tis the season to be jolly and eat lots of Mince Pies! Every Christmas Eve I take part in two of my favourite food traditions! First, I get up super-early and go to the Butchers with my Dad to pick up our turkey and other trimmings. Then, in the afternoon/evening I come home to make Mince Pies with my Mum. So if you were fretting about not having made any mince pies yet, don’t worry there is still time to make them before Santa comes! Trust me I know! Normally I work until 5pm on Christmas Eve and still manage to get a batch in before we head off out to our annual Christmas party at a family friends. So if you’ve got an hour to spare follow the recipe below and you will have beautiful mince pies, better than any shop bought variety! Sieve your flour and salt into a bowl. Cut the fat into cubes and the rub into the flour. Do this by pushing the fat and flour through your fingers. Once the mixture resembles fine bread crumbs (and there are no large lumps of fat) add the water and stir until the mix begins to bind. To bring it all together, use your hands to form it into a ball. You may need a little more water to get it to bind together properly but don’t worry just go with your instincts! Next place the ball of pastry in a bowl cover with clingfilm and refrigerate for 15mins. After 15mins, dust a work surface with flour and cut the ball into two pieces - one representing ⅓ of the pastry the other ⅔rds. Roll out the larger pastry ball until a quarter if a centimetre thick. Using a large round cutter, cut out 13 bases. Gather the scraps together and roll out again as and when you need to. Do the same with the small ball of pastry using a cutter one size smaller than before. Again cut out 13 pieces, these will be your lids! 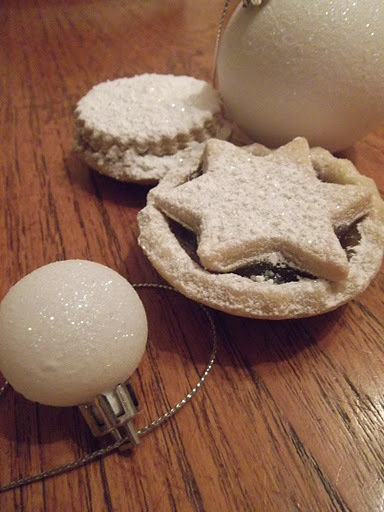 Alternatively use a star cutter for more decorative pies. Grease cupcake tins and place the larger circles into the pans. 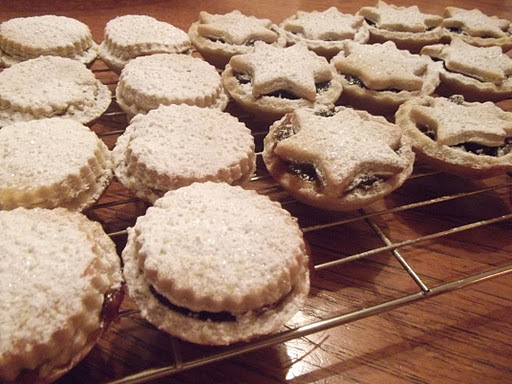 Fill with a teaspoon of mincemeat and brush the edges with a little milk before placing the lids on top. Prick the lids with a fork and brush again with more milk. Place in the oven for 15mins or until golden, at gas mark 4 turning round halfway through. Once they are done pop on a cooling rack and dust with icing sugar. I love all of the food traditions surrounding Christmas. Especially visiting the butchers with my Dad. The butchers is a family run affair in Baldock and its lovely that they remember their customers even if, like us, they only come once a year. The drive to the butchers involves a short trip through local towns and villages which is absolutely stunning when its frosty or it has snowed. Each year we get up at 6am aiming to get there about 6:45 for its 7am opening. We got there bang of 6:45 today and a queue had already formed! One year the queue was so long they bought hot mulled wine and mince pies out for us while we waited. We even got in the local paper! The food is all local, and organic and more importantly, delicious. This year we are experimenting with the black streaky bacon which has been cured in molasses and we have got the most beautiful duck breasts in Worcestershire sauce for boxing day – my favourite. Do you have any food traditions that you do around Christmas? I’m also hoping to start my own this year – watch out for my Christmas cake recipe over the next few days! Lots of Christmassy Love, Emma! Update! Walk off those Mince Pies! The lovely people over at Living Streets.org have come up with the brilliant idea of a mince pie calculator. The idea is, that you go for a lovely Christmassy walk, type in your details and how long you went walking for, and it tells you how many mince pies you have walked off! So now you really can have your mince pie and eat it, so long as you go for a walk and use the mince pie calculator. You can find it here: Mince Pie Calcultor!